I can’t remember the last time I had a full night’s sleep. You know the kind that is reparative and refreshing. It must have been in the late 1970’s though. It has been downhill ever since. My Dad used to say, “if you think that you are tired now, wait until you get to my age!” Well, I would rather not wait until I am over seventy to find out. Being tired all the time is no fun at all. In fact, it can even be deadly. Jesus has already dealt with our restlessness do to sin through his all-sufficient atoning death and sacrifice on Calvary’s hill. We were enemies of God, but now we are at peace with Him. (Romans 5) In Christ, we already have salvation and the promise of eternal rest. But what about our daily struggles? Jesus is our High Priest, and he understands our trials and temptations. (Heb 5) His shed blood washes us of all sin, past, present, and future. In Him, we find all of the spiritual rest that we will ever need! Trust in His promises today and claim them as your own. Our little church building is situated right on a major throughway in Ensenada that connects the west and east side of town. Serious accidents happen very frequently here – almost every week. A few of these have occurred within a few feet from where we live. But last night’s wreck was too close for comfort. At about 10 p.m., the family and I heard a screeching noise followed by a very loud boom that caused the ground to shake outside our house. 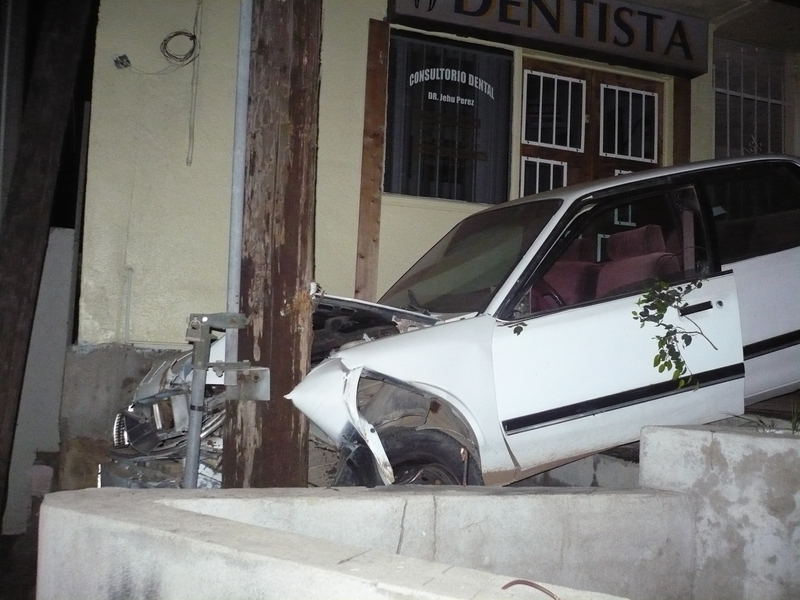 Instantly, we ran out to see what had caused it, only to discover that a white four-door sedan hit the center divider and careened toward the Dentist’s office next door to the church-building. It came to a dead stop after wrapping itself around two light posts that stand in the corner of the church’s property. Two young teenage boys that happened to be walking by witnessed the entire sequence. They were returning from the store when it happened, and they said that the driver somehow jolted from the car and ran away. How he survived at all is a mystery. The crash was so strong that it broke apart the cement sidewalk underneath. We had just finished a congregational prayer meeting no more than 15 minutes earlier, and everyone had gone home by then. If the wreck would have taken place earlier, there is not telling what might have happened. Sometimes the children are outside playing on the sidewalk because there is nowhere else to go. My son Santiago and the Dentist’s two teenage boys often practice with their skateboards at that time of day. Then there is always a constant stream of passersby. Fortunately for everyone, no one was hurt. It is at times like these that we are able to see God’s grace and protection for His little ones. We praise Him and give thanks for His everlasting care even in times of trial. YOU ARE PERFECT! Yes, it’s true! It may sound strange to our ears, but the fact is that by one offering He [Jesus] has perfected forever those who are being sanctified (Hebrews 10:14). If God’s word is true, and it really means what it says, then you and I have been perfected forever through faith in the finished work of Jesus at Calvary. This has to be one of the most liberating messages that I have ever heard preached. (Note: If you are interested in reading more on the this subject, please download the following tract “You Are Perfect”, or follow this link to an online video message by the same title). For those who are depending on their dead works to justify them before an infinitely holy God, the burden of guilt that they must endure precisely because of their imperfections is gargantuan. Who can remain standing under the enormous pressure of that load? No one! No matter how good we may think we are, there are plenty of things in our lives that just keep reminding us of our shortcomings. The vast majority of Mexican people have never been set free from that burden of guilt that they must carry on their shoulders from cradle to grave. They have been taught that to please God they must acquire enough merits to become deserving of His grace and forgiveness. They have been led to believe that God’s grace is not free, and that it is instilled into us in increments as we observe certain religious traditions, practices, and rituals. The same can be said of those who have been indoctrinated in the “holiness” tradition. Probably a good eighty percent of the evangelical community in Mexico belongs to some branch of the holiness movement. Basically, this school of theology teaches that one becomes fully acceptable to God by one’s outward piety or holiness. According to holiness teachings, one cannot claim to have assurance of salvation until one is walking in perfection or holiness before the Lord. But if this is true, than we really do not need the Jesus Christ or his atoning death at all! Again, to live under the burden of “holiness” doctrine is to live in total uncertainty of one’s personal salvation. Today, I am so excited to report that God is moving in our midst in marvelous ways! Last Sunday, I issued a call to a congregational day of prayer and fasting as reported in my previous update. Many answered that call and set that day aside for this very purpose. We asked God to give us a breakthrough in our church attendance and overall morale. On Wednesday, I had prayed over each chair in our little church building, pleading with God to fill each space with a soul to be won or a believer to be reconciled to Him. I am delighted to report that God has begun to answer our prayers!! This Sunday, our attendance more than doubled in one week! Where did all of these people come from? There is only one possible answer to that question: God brought them! By the time the service was over, we had used up all of the communion cups and the coffee pot was empty. Now, I can only attribute this growth miracle to the Almighty who made His presence manifest in the lives of those who came. During the invitation, a couple came forward for prayer and to re-consecrate their lives to Christ. But this is no ordinary couple. Chuy had been a pastor in a holiness church, but had burned out and strayed away from the Lord for many years both he and his wife Marisela became chain smokers and showed no sign of wanting to quit. Recently, they had been attending a Charismatic fellowship in town called Vino Nuevo, but for some reason Chuy felt compelled to attend our service. Do you suppose that God had a plan for Chuy in response to our prayers that were presented to God just a few days before? 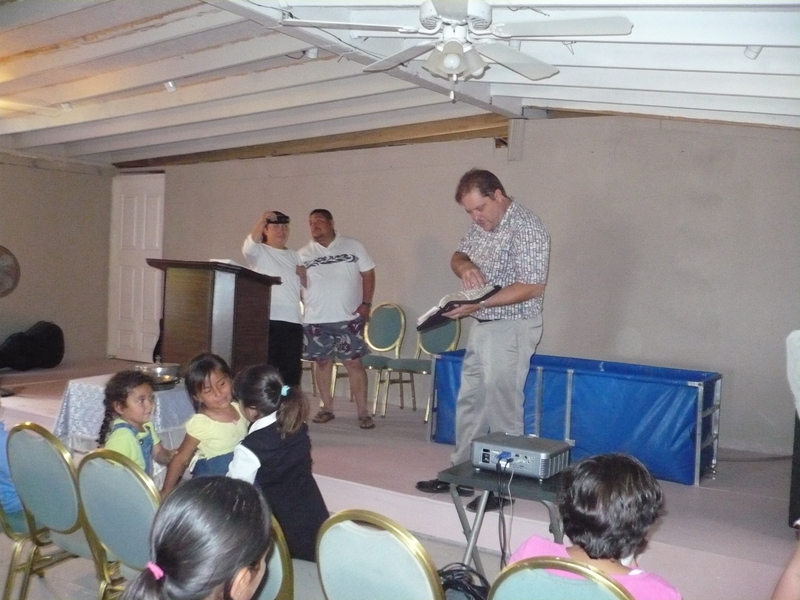 As I presented the message “You Are Perfect,” I could tell that the Holy Spirit was doing something very special in the life of Chuy and Marisela. Marisela has had some back problems that have required surgery, but for some reason these have not been fully resolved through medical treatment. She struggles with quite a bit of pain and requested to be prayed for. Chuy also has problems with his legs. He has worked very hard all of his life as a bricklayer and his lower body seems to be buckling beneath him. When Chuy and Marisela came forward for prayer, I embraced them both. I could tell that this was an intensely personal moment for them as they re-claimed their inheritance in Jesus Christ. Imagine the scene if you possibly can. Here are two precious souls for whom Christ died to save them from eternal damnation. Yet, they had left the church for many years and had fallen into a sinful lifestyle. Yet, God was more than willing to call them back unto Himself and He used us to deliver the message that they desperately needed to hear. Both of them could not stop from crying and sobbing under the presence of God’s love! What a joyous occasion this was for us as we joined them in thanking the Lord for making provision for our sanctification and perfection through the shed blood of our Saviour Jesus Christ! We will continue to pray for Chuy and Marisela, and we ask that you would pray with us. But also pray for Abraham, Claudia, and Sergio who need to make a decision for Christ very soon. Keep on praying for our church, and ask God to continue showering His many blessings on our lives. Today was a day of prayer and fasting for our local congregation. I issued this call to prayer after I learned that a ministry in the States had convoked an “International Day of Prayer and Fasting ” for the purpose of completely revoking the REAL ID Act, which is the latest in a series of attempts to rob the American public of what little personal liberties they still have left. In our particular case, we decided to include another petition that hits closer to home: the increased violence and insecurity in Baja. 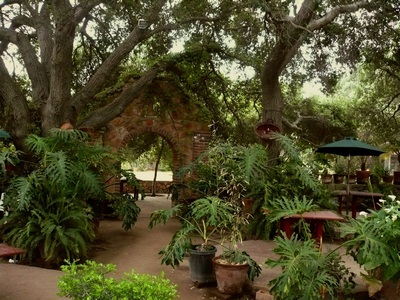 Since January of this year, reports of insecurity in Baja California have taken a heavy economic toll on key tourist destinations. Tourism is the third most important source of revenue for the country, but since the surge in violence Mexico has fallen to 8th place among the favorite tourist destinations for international travelers. 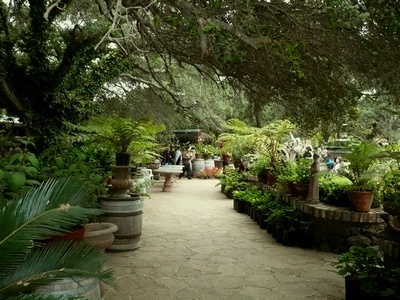 Ensenada’s economy depends heavily on tourist trade. Without that source of revenue, the city slows down to a crawl financially. It looks like there will be toughs times ahead for our community, and we feel that is our duty as Christians to intercede for the needs of our church members, as well as for the general population. Besides the increase in organized crime, the problem of drug abuse on a local level has also skyrocketed in the past few months. This social cancer is eating away the very moral fiber that gives hope and a future to our next generation of young people. It has been said by those who closely monitor this phenomenon that, in another five years, the number of individuals suffering from the side-effects of drug use or withdrawal will likely double. That does not include the legal drugging of children through the “mental-health” profession. I want to encourage you to set apart a day each month to fast and pray for your own community. One thing that has helped me to concentrate on those who I need to be praying for is to physically stand in front of each empty chair in our church building and pray for the person that is going to fill that chair. It’s not a technique or anything, it’s just one way help me to step out in faith and cry out to God to draw lost sinners to himself. You know what I mean? Christ left heaven and came to Earth for only one reason: to seek and save the lost. Incredible things happen when God’s people unite in prayer. There is never a shortage of reasons to start a regular prayer ministry in church that includes special times set apart for dedicated intercession and fasting. God’s promises are every bit as true today as when He gave them, so let’s move ahead in faith to victory! CHURCH PLANTERS OR KINGDOM BUILDERS? What does the great commission in Matthew 28:18-20 consist of? Has the Lord sent us out in the World to plant churches or to build His Kingdom? Some would probably say “both” and they would be mistaken. Nowhere in the Bible do we find terms such as, “purpose-driven,” “mission-driven,” “seeker-sensitive,” “church plant,” etc. These have become common buzz words for those who view the church more as an enterprise rather than a Spirit-led entity, and whose methodology resembles that of the business world rather than the life of the early church in the book of Acts. Is that saying to much? I don’t think so. The purpose-driven church has lost its way, and has become worldly in both doctrine and practice. The facts are there for all to see, so I will not belabor that point. But how do we get back to the basics of the Christian faith? How do we re-discover our true identity as a chosen generation, a royal priesthood, a holy nation, a peculiar people, called out of darkness into His marvelous light? (1Pe 2:9) I believe the key to answering that question can be found in the very nature of the Gospel itself. Repeatedly, the New Testament writings refer to the gospel as the “gospel of the kingdom.” (Mat 4:23; Mat 9:35; Mat 24:14) and the “gospel of the kingdom of God.” (Mar 1:14) What does this mean? In a nutshell, it means that one day soon all of Christ’s enemies will be made his footstool (Heb 10:13), the Lord shall put down all rule and all authority and power (1Co 15:24), and the kingdoms of this world will become the kingdoms of our Lord, and of his Christ; and he shall reign for ever and ever (Rev 11:15). Those of us who have believed on the Lord Jesus as the Christ have already become citizens of that kingdom by grace, through faith, in baptism, for obedience to the King “Who hath delivered us from the power of darkness, and hath translated us into the kingdom …” (Col 1:13) So, as we await the future manifestation of that eternal kingdom of which the church is a foreshadow, our mission is to cultivate voluntary submission to Christ (discipleship) under the banner of the gospel of the kingdom of God. Does that make sense? How then can we discern between the fake and the genuine article? Jesus did say that we shall know the tree by its fruits didn’t he? (Matthew 17:17-19) If true Christianity is God’s reign over the hearts of men, then it seems rather obvious that the true remnant will be occupied with fulfilling that will of God for His church in every possible way. In other words, true Christians will be found moving toward perfect obedience, while apostate believers can be found joining forces with evildoers. There is no way you can go wrong with a church like that! One of those churches has been Christ’s Church in the City at Highland Park where our dear brother Bill Pile presided until his recent departure to be with the Lord. Other churches are Valley Christian Church (Bullhead, AZ) and Camelback Christian Church (Phoenix, AZ.). I could name others, but these are sufficient for the purpose of illustrating my point. In closing, I want to encourage all of you to meditate on these things in your heart, and resolve today to be a kingdom-builder instead of a church-planter! Miriam, Kimberly and I just returned from a 1200-mile round trip to Hermosillo, Sonora for a men’s rally and weekend speaking engagement. Hermosillo starts to heat up this time of year, so the temperature stayed around 100 to 110oF during the day. It cooled down to about 85oF at night. Fortunately, the church where the day-long meeting was taking place was equipped with a modest air-conditioning unit that kept the heat down to a livable level. 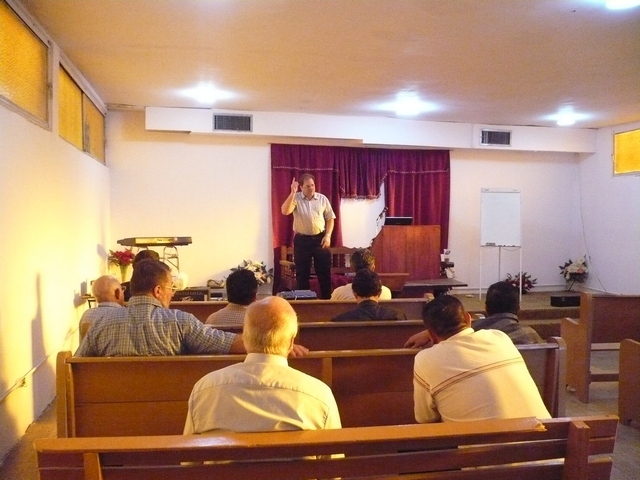 The men’s rally was organized and sponsored entirely by the local churches. 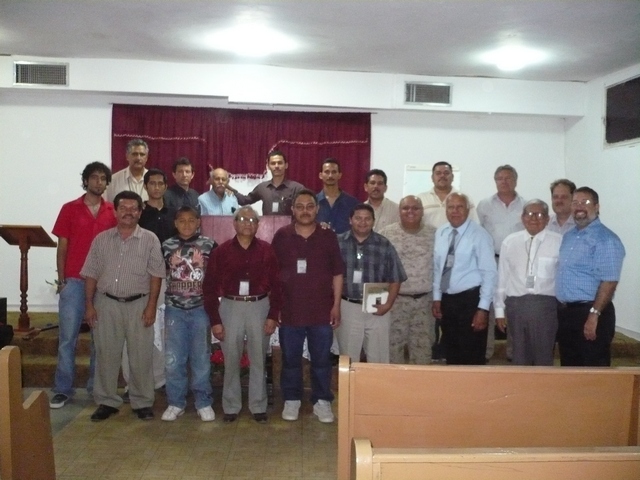 A group of about 20 men from churches located in Baja California, Sonora, and Sinaloa met for fellowship, encouragement, and Biblical teaching. The sessions ran from 8 a.m. to about 9 p.m., only breaking for meals. Among the scheduled speakers were Chuy Field (Green Valley, AZ), Jesus Amaya (Hermosillo), Ruben Rendon (Ensenada), Manuel Correa (Tijuana) and Aldo Dominguez (Mexicali). The women helped with meal-preparation and hospitality. The invitation sent to us had arrived late – just one week before the event – so I had not made any previous plans or preparations to attend. Nevertheless, I had a strong sense of God leading us to go. Furthermore brother Alejandro Julian of Hermosillo had insisted that I come, and he had asked me to stay and preach for their Sunday service. Alex is elderly and frail after a lifetime battle with diabetes. He is totally blind in one eye and can hardly see out the other. His wife Esther also has difficulty moving about. Their oldest son Pedro Julian recently passed away do to complications with Diabetes, so I felt compelled to go and encourage them as much as possible. During the 15 long hours behind the wheel, I had plenty of time to talk with God and inquire about His specific purpose for this visit. I did not have a clear picture of what it was that I was suppose to be doing. But the Lord had something special in mind. Two of the speakers that were scheduled to be there had to cancel their appointment for various reasons. When I found out about the situation, I asked God “is this the reason why you brought me here?” Just in case, I prepared some hurried notes the night before. I prayed, “Lord, if you want me to speak to these men please confirm it with an unexpected invitation on behalf of the organizers.” I believe that God must have heard my prayer, because I was approached by brother Aldo Dominguez who invited me to speak on the following subject: “Perilous Times – 2Timothy 3:1” Was this a mere coincidence or the providential intervention the Almighty? I emphasized the need for evangelistic zeal and the urgency of the hour. The response to the message was excellent. One brother told me, “Phil you always have something interesting to say and you get me to think.” That has to be the best compliment that any speaker can receive. I spent over an hour conversing with a couple other brothers as a result of my presentation. Brother Alex asked if I could repeat it on Sunday morning. Everyone was discussing these things among themselves. It was as though God had chosen this unworthy vessel to convey the exact message that these dear brethren needed to hear. On Sunday, I delivered a slightly different version, based on Rom 13:11-14: “And that, knowing the time, that now it is high time to awake out of sleep: for now is our salvation nearer than when we believed. The night is far spent, the day is at hand: let us therefore cast off the works of darkness, and let us put on the armour of light. Let us walk honestly, as in the day; not in rioting and drunkenness, not in chambering and wantonness, not in strife and envying. But put ye on the Lord Jesus Christ, and make not provision for the flesh, to fulfil the lusts thereof.” (Rom 13:11-14 KJV) At the end of the sermon, I issued a call to consecrate our lives to our Lord and Saviour, for the purpose of serving Him wholeheartedly. Surprisingly, all able-bodied believers (about thirty in total) came forward and knelt on the floor to pray. After the morning service, I had several comments that were a tremendous encouragement to me. One member said, “Brother, I can tell that the zeal for the House of God consumes you.” Another said, “Now that is the kind of preaching that we need!” Sister Esther made the following comment to my wife, “I wish Phil could come to Hermosillo to serve!” Most of the folk there know me, so I am no stranger among them. Yet, their love for me and my family has been made manifest time and time again. We love them back! 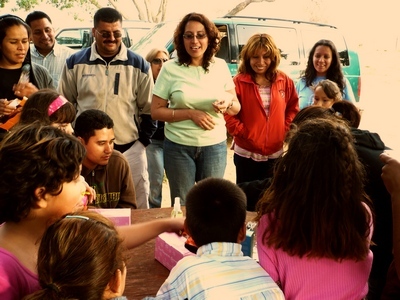 Sister congregations in northwestern Mexico are somewhat geographically isolated from each other, so any time that they can afford to come together to share in their commonality of faith is a time well spent. I want to thank you for making it possible for us to make the trip and the necessary repairs on our vehicle. Without your prayers and support, this special time of ministry would have been impossible.